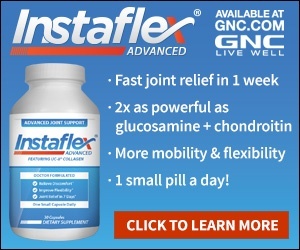 Next review Instaflex - I am glad I saw this site. As per their advertising, I ordered a 14-day supply of this product for $4.99 and began taking it. Less than a month later (probably right after the 14-day period), I received another bottle. I didn't think I ordered this bottle, so I checked my account to find that not only was I charged the $4.99, but a later charge was found for $74.99. Somewhere on their website there is probably a statement that says if I don't cancel within a certain time (probably 14 days), then I will automatically be a continuing customer. After talking to their SECOND representative and complaining, she told me that it is easy to find this additional information on their website. But when a company advertises for a 14-day supply, that's what I expect to pay for, and for nothing else. I didn't even have time to determine whether the product was working. This is a scam, and any thoughts that I had of respecting this company are gone forever. Protect your charge account. Review #271005 is a subjective opinion of User271005. Same here . I order 14 day sample supply and paid 4.99 Shipping. Paid with Discover card was just charge 74.98 for additional supply. Got RMA number. Discover to dispute charges. Buyers beware!!!! !